We were blessed with such gorgeous weather today that I knew I had to plan an outdoor activity for the boys. Going along with our recent rainbow theme I pulled out a classic favorite. We make sidewalk chalk paint often; it's one of our favorite homemade paint recipes. I made this batch in rainbow colors, and as a bonus I made it erupting sidewalk chalk paint! Directions: Making sidewalk chalk paint is incredibly simple. 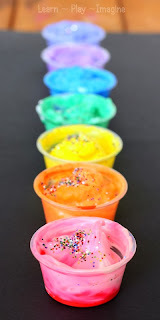 The traditional recipe calls for equal amounts of water and cornstarch with added color. 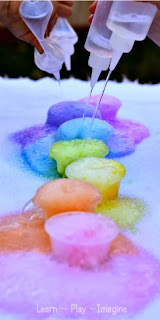 To make erupting sidewalk chalk paint I mixed 1/3 cup of water, 1/3 cup of cornstarch, and 1/3 cup of baking soda with each color. Remember that the base of this paint recipe is white, so add a good amount of color to achieve vibrant shades of paint. For easy preparation I mixed the ingredients in a measuring cup with an easy pour spout to make filling the squeezy bottles an easy task. The boys had a blast painting all over our driveway. It was fun watching how each boy approaching the activity. J-Bug (4) looked for unique places to squirt the sidewalk chalk paint. He was especially fond of painting in the cracks in our driveway. Tank (25 months) stood up and squirted the paint down and even turned in circles while painting. Peanut (25 months) preferred to sit on the ground and paint methodically. Each boy was fascinated with the texture of the paint as it dried. It's super soft and smooth on the sidewalk. We frequently use squeezy bottles in our activities, because they are great for boosting fine motor skills. Once all the squeezy bottles were empty I pulled out the spray bottles full of vinegar. JZ (6) couldn't get his hands on a bottle fast enough. Watching reactions and making thing erupt are high up on his list of favorites. Squeezing the spray bottles is another great exercise for fine motor skills. When done, a simple rinse with the hose washes away all of the mess. We've never had any issues with sidewalk chalk paint staining, but you might consider testing a small area before trying this. I prefer washable liquid watercolors over food coloring since it washes clean easily. Here are tips for messy play as well as laundry tips to avoid stains and keep clothes bright. We've also made scented sidewalk chalk paint and used it to practice the alphabet. I can't wait for it to get warm so we can try it out! Does this stain the sidewalk at all? I love the idea of putting this in squeeze bottles. We tried the sidewalk paint recipe last week and it was really hard to paint with on our uneven, cracked, old driveway, but squeeze bottles would work great. Thank you Thank you Thank you & Thank you for sharing such brilliant ideas. May God continue to bless you. My 4.5 yr old would LOVE this. You say "washable liquid watercolors", what are those exactly? Like tempera paint? when do you use the vinegar? After they paint they squirt vinegar on the paint to watch it fizz. Your sidewalk chalk paint was pretty good. I think it's one of the favorite homemade paint recipes. Thanks for sharing this wonderful blog Allison. I love the idea of putting this in squeeze bottles. Thank for sharing ! Nice tips. I want to make something for my son but I have no idea. Now I guess I found it! Thanks. Thank you for sharing such brilliant ideas. when do you use the vinegar? Thank you for sharing such brilliant ideas. Does it stain clothes? Great idea for my son. Thank for share this post ! brilliant ideas!!! Does it stain clothes? Do these chalk paints work well for painting exterior walls? The weather is also just starting to get better over here as well and I think this will be a great outdoor activity for my little boy, too! Glad I found this post, thanks! Cute kid having fun with the painting !